The Environmental Protection Agency (EPA) proposed a new rule in March that would effectively limit new fossil fuel plants from emitting more than 1,000 pounds of carbon dioxide per megawatt hour (MWh) of energy produced. The rule will impact new coal power plants that are still on the drawing board, and is an importantstep in limiting emissions from the energy sector, which is the biggest source of carbon pollution. We still have a lot of work to stop polluters in the desert, however. Many families moved to the desert regions of California in part to escape the notorious smog of the Los Angeles basin. But the clear skies are deceptive since there are several industries -- including coal power plants -- spewing millions of tons of carbon and other harmful poisons into the air, hurting human health and contributing to climate change. A "forget-me-not" (Cryptantha angustifolia ?) only a few centimeters high blooms in the shelter of a giant granite boulder in the Mojave Desert, with lichen adding a dash of color to the granite. Solar and wind energy companies are seeing their "green" image slip away as they stake claim to large swaths of sensitive wildlife habitat in America's southwest, and balk at conservation groups calling for smarter siting decisions. Although many in the grassroots conservation community wish the national environmental groups would be more vocal and consistent in their stand on responsible renewable energy standards, even the handful of examples where national groups do demand that renewable energy projects reduce impacts on our ecosystems, the renewable energy industry and even policymakers have resisted. Germany added over 5,000 megawatts of rooftop solar in one year without sacrificing any natural treasures. Sacramento has spent nearly two years planning to destroy pristine desert for a 465 megawatt wind energy project. And apparently they had to silence the stewards of our lands in order to get it done. 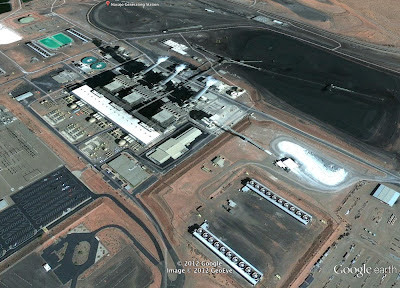 Will we listen to biologists, or First Solar's corporate executives? 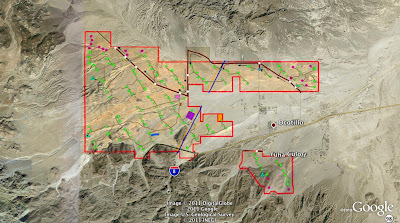 It seems like the obvious choice for an environmental organization would be to listen to the scientists that have declared Ivanpah Valley too ecologically important to bulldoze for additional solar projects. For the Sierra Club, I'm still not sure which path we have chosen. As a Sierra Club member, I am frustrated that my organization remains irresolute regarding the future of the Ivanpah Valley. The Sierra Club's Beyond Coal campaign has recognized the ecological significance of Ivanpah, and earlier this year encouraged members nationwide to submit comments on the Department of Interior's Solar Programmatic EIS supplement that mentioned Ivanpah as an area not suitable for additional solar projects. Yet the Club now appears to be working to find a way to permit more large solar projects in this treasured place. Enbridge -- Canada's largest transporter of crude oil with projects in the infamous tar sands -- will now profit from a solar project in the Ivanpah Valley, according to Reuters. 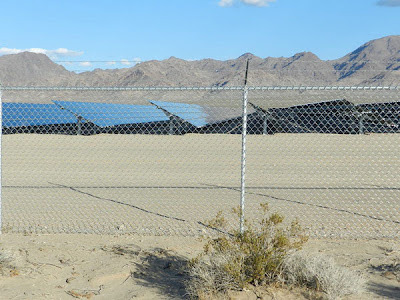 Enbridge is buying First Solar's Silver State North project, which destroyed nearly a square mile of ecologically intact desert habitat that serves as a critical genetic linkage for the threatened desert tortoise and other species. 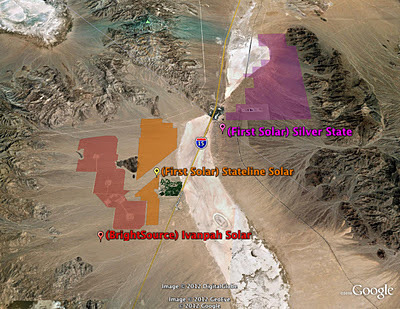 First Solar is also proposing to expand this project with a much larger second phase known as Silver State South. These facilities use the same type of solar panel that can just as easily be installed on rooftops or on already disturbed lands. Here is another opportunity to remove barriers to local and democratic clean energy, so get ready to fire off an e-mail to Uncle Sam no later than 26 March. Instructions below. So far, 27 states have approved Property Assessed Clean Energy (PACE) programs, which allow homeowners to improve energy efficiency or install rooftop solar panels and pay the costs over time through their own property tax assessment. PACE is similar to other "special assessment" programs that have been used by municipalities for decades to finance public or private property improvements that benefit the community. 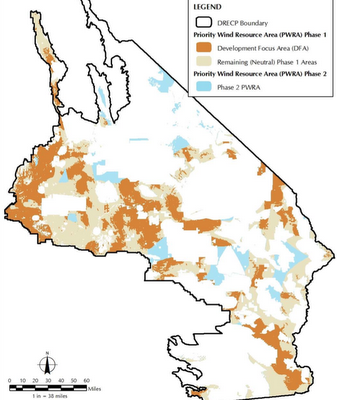 Since energy efficiency and distributed generation reduce greenhouse gas emissions, create local jobs, and are better alternatives than building expensive new power plants and transmission lines that destroy wildlands, PACE is certainly in the public's interest. The Nopah Range at sunrise in the Mojave Desert, east of Death Valley National Park. Before First Solar commits to building solar projects in the Ivanpah Valley, they should take a close look at BrightSource Energy's experience there. The Los Angeles Times today posted an insightful article on the costs of building a solar energy project on some of the best desert tortoise habitat in the Mojave Desert. Focused on BrightSource Energy's solar project in the Ivanpah Valley, the LA Times describes communications in which BrightSource Energy complains about the costs of relocating tortoises, saying "[t]his truly could kill the project". Yet it was BrightSource's choice to ignore the warnings of biologists and build on a site noted for the relative abundance of tortoises. Biologist have expressed concern that the scale of proposed utility-scale renewable energy development in America's southwestern deserts could push various species of plants and wildlife to the brink by destroying or fragmenting large swaths of otherwise ecologically intact wildlands. This energy model ignores the opportunities to build on already-disturbed lands or focus on distributed generation -- such as rooftop solar -- and will ironically compound the challenges wildlife will face as a result of human-induced climate change. 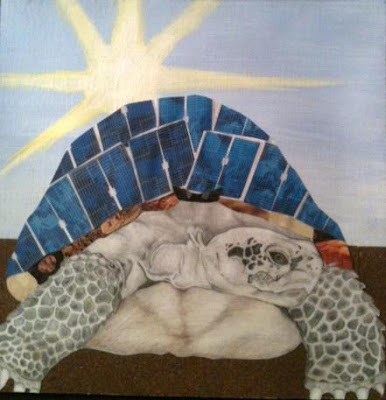 The desert tortoise is an icon of this quandary, and it caught the attention of high school student Halle Rayn Kohn. In a mixed media piece of art using acrylic paint, sandpaper, and a collage of pictures and magazine cut-outs, Halle's art depicts a species burdened by human energy demands.